In its continuing series of instructional webinars for Notary professionals, the NNA in February will examine how to properly handle loan signings, and the different types of notarial acts. The first webinar, specifically designed for NSAs, is titled Being a Team Player in the Loan Closing Process and will be held Thursday, February 9. NNA Vice President of Best Practices and eNotarization William A. Anderson will be joined by Certified Senior Escrow Officer and Instructor David A. Shean to discuss the role of Notary Signing Agents in the loan closing process. This event is free for NNA members and $14.95 for non-member Signing Agents. Then on Friday, February 24, the NNA will continue its​ “Commonly Asked Questions” webinar series withAcknowledgments, Jurats, and Oaths – What’s the Difference?Hosted by NNA Seminar Instructor Susi Sivkov, sessions are slated for 9 a.m., 11 a.m. and 2 p.m. Pacific Time and will be available on demand at a later date. 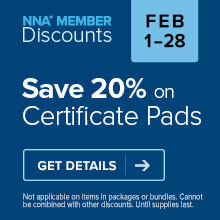 The three 30-minute webinars are available exclusively to NNA members at no additional cost. Information and links to register for the February 24 webinar will be provided at NationalNotary.org as they become available.